At the beginning of our activities at the request of a customer which we prefer not to disclose preliminary estimates were made for aerospace system design. 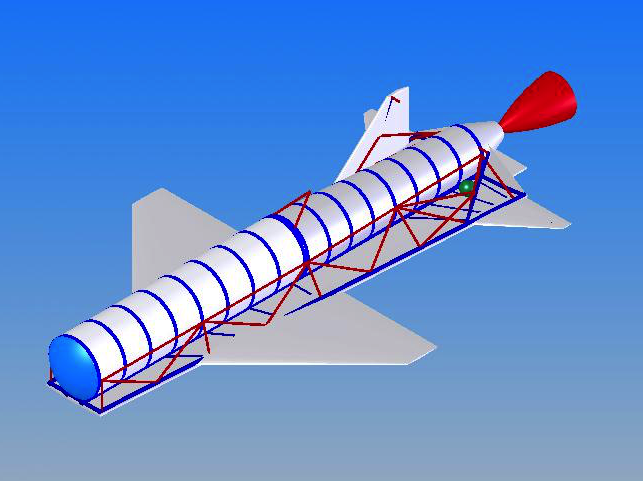 A project of reusable two-stage aerospace system with dual-use capability is developed. Il-76 strategic airlifter is considered as a carrier aircraft. The main purpose of Vyuga is technological and general biological research on a commercial basis, and the creation of new materials in space flight. Besides, the system can be used to launch microsats up to 450 kg. The military applications are reconnaissance, monitoring and interception of spacecraft (air launch allows to lift payloads into a wide range of orbital inclinations), and carrying of precision-guided munition (aircraft carrier killer missile). 2. 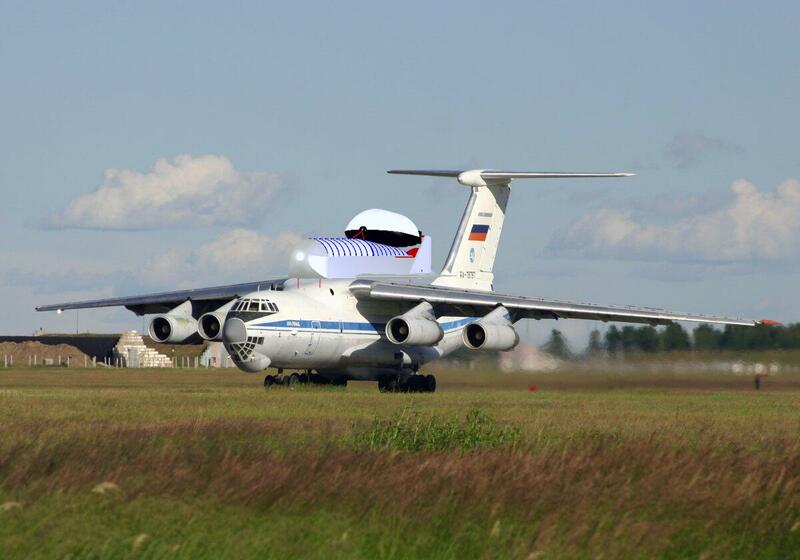 Use of Il-76 as a carrier aircraft. 3. Ability to launch into a wide range of orbital inclinations. 5. Mobility - the capability to launch spacecraft from the countries of customers. Now more details on the development of the aerospace system. Having defined Vyuga primary objectives, payload mass of the system was chosen to be about 450 kg to LEO (similar payloads are carried by Foton (Photon) satellites). Reusability of the system, or partial reusability, was considered as much desired option. We considered M-55H Geophysics, MiG-31 and Il-76 as possible carrier aircraft for system of such a size. Option involving An-124 Ruslan and An-225 Mriya aircraft was rejected because of their excess payload capacity. Tu-160 was not considered due to a small number of available aircraft. 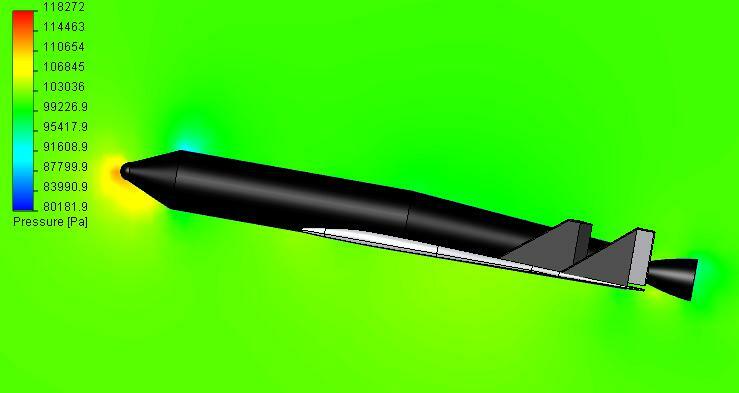 High service ceiling of M-55H Geophysics aircraft (20.4 km) would allow to achieve a significant gain in delta-v for the aerospace system, necessary for orbit insertion, thanks to reducing aerodynamic losses and using a liquid rocket engine having nozzle with high expansion ratio. However small payload capacity (3.5 t) wouldn't allow to create a reusable aerospace system. The only possible option in this case is expendable LH2/LOX launch vehicle with payload of about 10-50 kg. High service ceiling of MiG-31 (20.6 km) and higher payload capacity (5-6 tons) than for M-55H would make this aircraft quite a real candidate for the role of carrier. But the primary advantage of MiG-31, its high speed, could be achieved only with compact load. 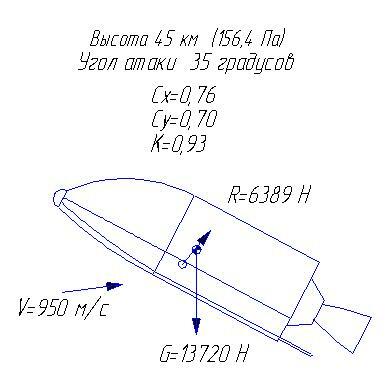 Piggyback placement of payload wouldn't allow to use MiG-31 as a supersonic booster. 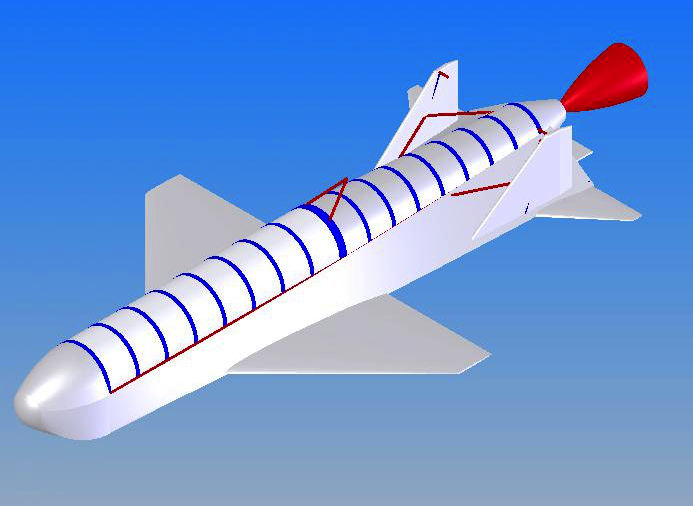 If creating a fully reusable system based on MiG-31 is possible, then with payload limited to 30-60 kg. Option involving widely used Il-76 strategic airlifter is inferior to the two options mentioned above in service ceiling (12 km), but significantly superior in payload capacity (43.4-47 t). In the case of piggyback placement of the system not only special mounting structures need to be provided, but also strengthening structures inside the aircraft. Possibility of implementation of this kind of separation was proven by launches of the shuttle Enterprise during tests involving modified Boeing-747. Mass of the aerospace system with mounting equipment - 35 t, separation altitude - 10 km. Internal layout of the orbiter. 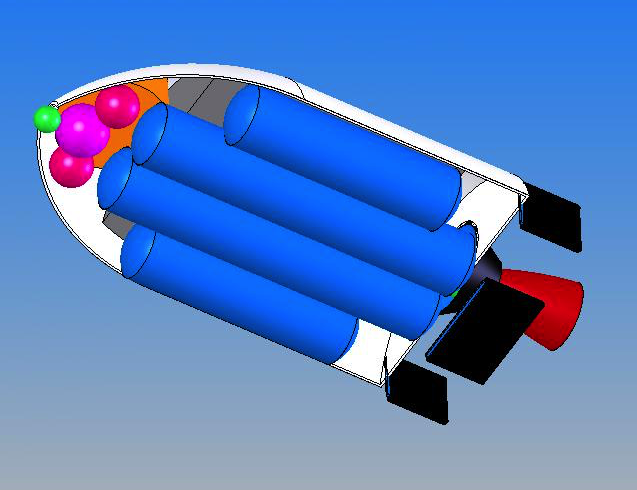 Shown here: oxidizer tank, parachute compartment, control system, payload section and powerplant. Orbiter without upper layer of HRC. Hull of the stage and hatch of the parachute compartment can be seen. Orbiter without hull and lower layer of HRC. Shown here: fuel and oxidizer tanks, spherical tanks, control system. Partially visible: parachute compartment and payload section. 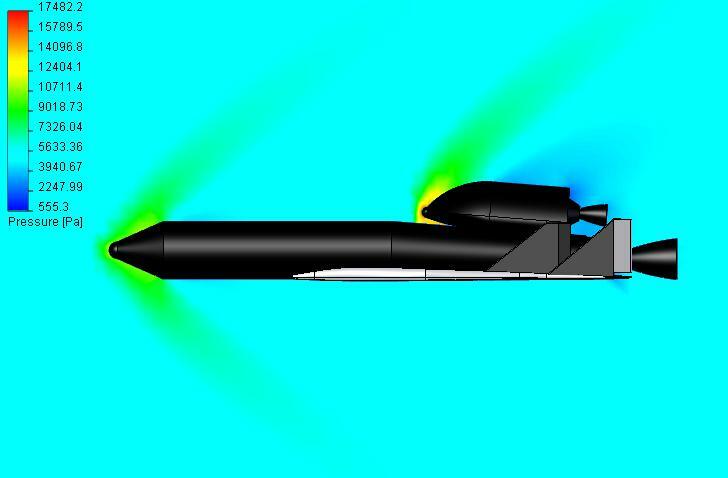 The orbiter design was subjected to testing in a virtual wind tunnel (modeling airflow around the body with special CFD software). This allowed us to determine its main aerodynamic characteristics, and also trajectory of descent in the atmosphere (see below). Balancing angle of attack is about 35 degrees. 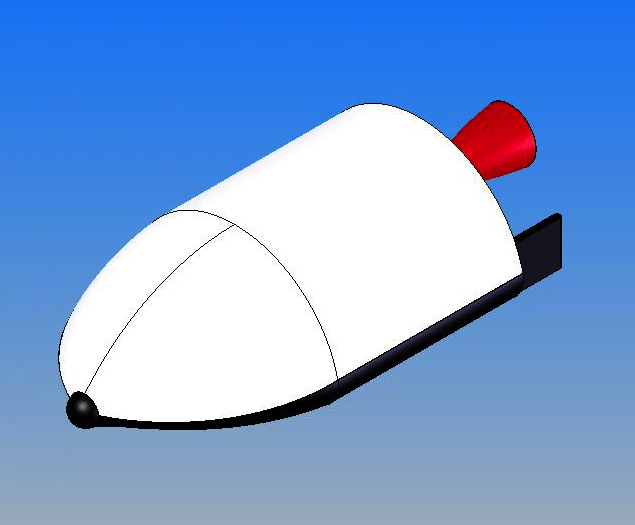 Before choosing the final version of the first stage design we have considered several airfoil designs, using conical tank for oxygen, and external tank option (similar to MAKS aerospace system). Besides, virtual wind tunnel tests were performed both for the stage alone and together with the orbiter. 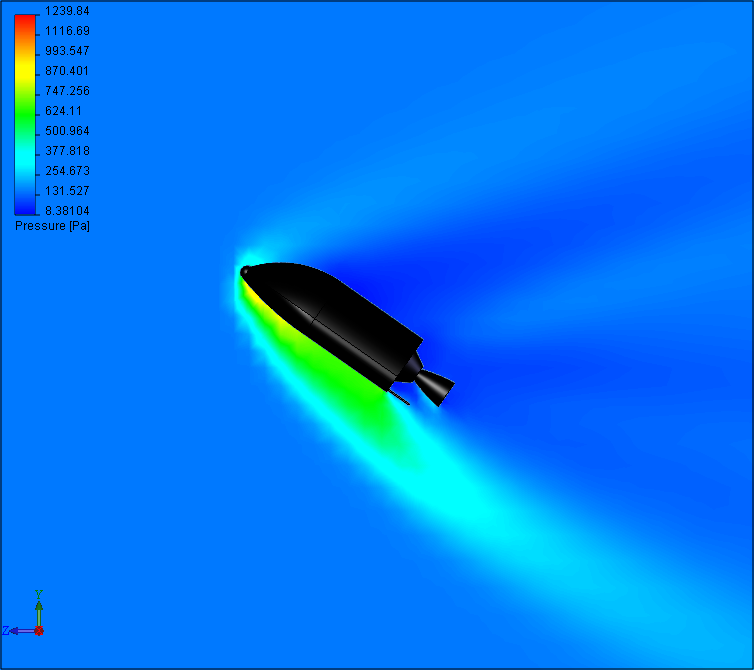 Results of the modeling helped us to determine flight path of the first stage. Then structural frame was designed. It consists of bearing truss, stringers in wings and tail, and main stringers. Main stringers are where thermal protection system (from below) and light composite tanks for fuel and oxygen are mounted (from above). The structural frame is expected to be made of carbon fiber. In this case its mass will be 1320 kg. A specialized internal truss is used to transfer loads to carrier aircraft. Structure of the truss was chosen so as to minimize modifications to the aircraft. Overall size of the truss allows to place it in cargo compartment of Il-76. It was originally supposed to manufacture truss elements of carbon fiber, but the strength calculations have shown the need for thickening truss elements and manufacturing them of titanium alloy. Titanium truss with elements of 85 mm in diameter meets the strength requirements (factor of safety is 1.3). The truss can be made lighter by reducing the diameter of elements of the lower zone to 60 mm. Mass of the truss is 6200 kg. Requirements of tightness, reliability, low weight, corrosion-resistance and a number of special requirements, including, for example, ability to completely drain propellant, are imposed on the fuel system. 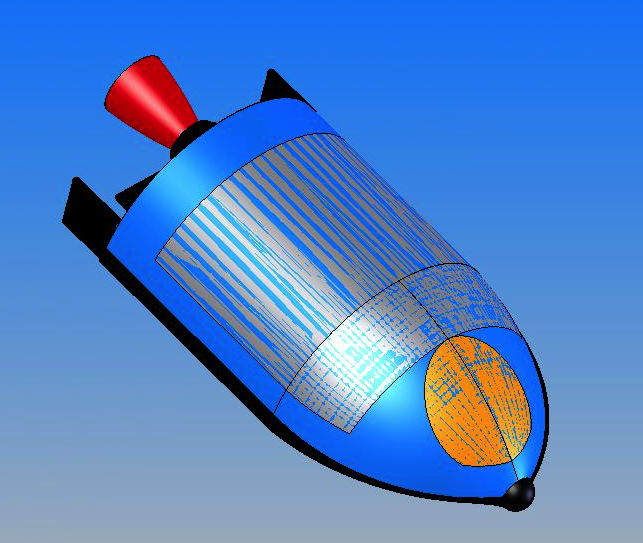 Based on the above we chose suspended cylindrical tank design of two-layer composite with end frames pasted in and bases of weldable AMg6 aluminium alloy. The tank is a self-sufficient structure in terms of strength and stiffness, it is mounted inside the body to its structural parts using elements, which are attached to frames of the tank during manufacturing. 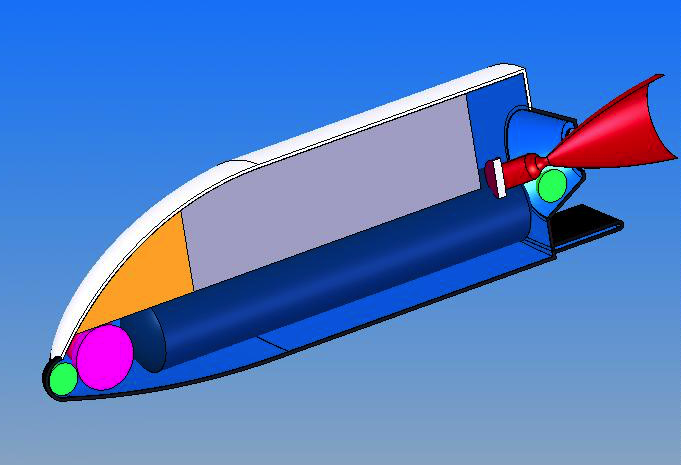 There are damper baffles stabilizing the level of propellant inside the tank, and a number of specialized elements mounted after the tank is assembled. Since the tank is intended for use with liquid oxygen at a temperature of 70-90 K, and carbon fiber reinforced polymers didn't demonstrate the required reliability in oxygen at such low temperatures, its design provides for manufacture of the inner part of a special PMF-352 film, on top of which roving of UGV carbon fiber with epoxy binder is to be wound. Frames, which are held together with non-metal materials by adhesive forces and tied using bandages of high-strength threads, are to be pasted in the marginal zones of the cylindrical section. Shape of the pasted in part of frame has a technological slope of 9 degrees to ensure high quality junction of metal and carbon fiber reinforced polymer. The first stage of Vyuga development - scientific research activities - will take 92 days (assuming 207 man-hours). Preliminary estimate of the cost of the scientific research is 3.2 mln rubles in prices of 2016. Total (with a margin of ~5 kg): dry mass - 3940 kg, wet mass - 30200 kg.